Transfer Grilles are suitable for installation in Doors, Walls and Partitions, where the transfer of air from room to room is required. Within our range of Transfer Grilles, there are three designs of frame and four styles of core providing flexibility of installation, choice of appearance and functionality. In its most simplest format, one of the three steel cores can be supplied loose for beading into the aperture, alternatively the core can be supplied with a U channel panel frame. When mounted into a door, our telescopic frame can facilitate a door thickness from 28mm all the way up to 52mm, with light tight or vision proof cores to meet your specific application requirement. 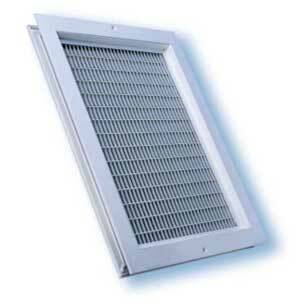 Cores only for transfer grilles can be supplied loose for beading into position by others. Cores with panel frames are available with or without screw holes as required. The standard fixing method for both the telescopic frame and pressed steel grille is screw fixing through the face plate. Non Vision Grilles [NVG Model short code]. Because of the flexibility of design and construction of our range of Air Grilles, Non Vision Grilles are easily produced for a wide range of applications including but not exclusive to Schools, Shops, Hotels, Restaurants and many other situations where privacy is a requirement. 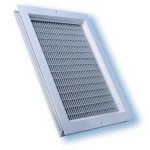 Narrow Transfer Grilles [NTG Model short code] are available where a slim profile is required. With our innovative design concepts, we have been able to produce a Narrow Transfer Grill that houses the slim core on the outer face of the door or panel. This leaves the remaining depth available to house other functionality such as a fire damper. See our Linear Bar Grille series of grilles for even more information on this particular model.